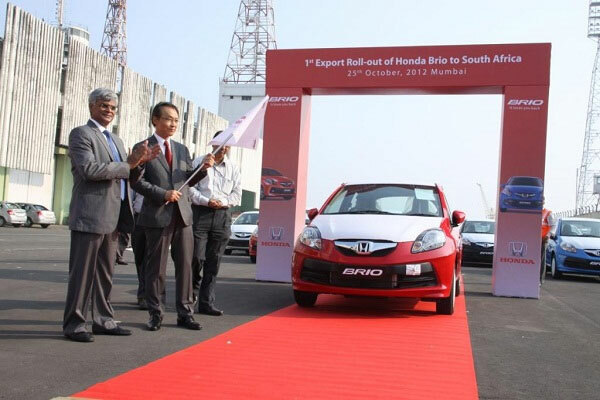 The first shipment of Honda’s funky new compact car the Honda Brio is en route from Mumbai to South Africa. The delivery is on schedule to arrive in your local Mekor Honda dealership in early December. The arrival of the stylish new Honda Brio in South Africa is already causing much a stir among existing Honda customers and anyone in the market for a compact car The hatchback will become the brand’s most affordable offering to date, bringing Honda’s advanced technology and superior quality to a wider audience than ever before. Despite its entry-price positioning, the Brio is a shining example of Honda’s close focus on latest-generation technology, tactile quality and long-term durability. For example, the Brio uses Honda’s Advanced Compatibility Engineering (ACE) which ensures high standards of safety and longevity. The Brio’s sophisticated 1,2-litre i-VTEC engine delivers both sparkling performance and high levels of fuel economy, thanks to its 16 valves and intelligent, electronically controlled variable valve timing. The result is 65 kW of maximum power, together with 109 Nm of torque. The Brio will be offered with a choice of manual and automatic gearboxes. A carefully tuned suspension ensures superior ride quality and responsive road manners. The new Brio’s will be one of the most affordable new cars on the market, but there have been no shortcuts on safety or quality. The new Honda is fitted with a full range of safety features, together with convenience and comfort extras to boot. The Honda Brio has been on sale in India since September 2011, and has already achieved sales of more than 25 000 units, while also claiming a number of Small Car of the Year awards. The Brio is keenly awaited and is guaranteed to take the South African compact car market by storm. The exact specifications and pricing of the new Honda Brio for South Africa will be confirmed over the coming weeks. Contact your local Mekor Honda dealer for details and to be among the very first to drive.